You are completing two years in office. How has the journey been so far? Or do you have any regrets? After Wednesday’s overwhelming response at the Auto Expo, my response to this question is a lot more positive. This whole expo is a huge step for us and a reflection of all the initiatives we have taken over the last two years. On whether I have any regrets—there will always be. I think we have come a long way but have a long way to go. The two new vehicle architectures showcased are a hint of what to expect in our showrooms in the next 15 to 18 months. There is a high degree of commonality, which means I can bring in new models much faster. Both architectures are completely future ready for battery, electric and powertrain solutions. This will allow us more intensive play in the electric vehicle segment. This will lead to a rapid increase in our product portfolio, take a much wider span of various market segments and create new ones. The Indian passenger vehicle market is going to become even more sophisticated. On the commercial vehicle side, our backbone, we have taken several steps. Through the products you see here, we have effectively closed all the product- related gaps. We have been able to ramp up at a very fast pace. The second quarter saw 70 per cent output increase and ramp up of 50 new models. The single-minded focus and sense of urgency, which we managed to create right from the top from our chairman (N Chandrasekaran) to all the way down to blue-collared workers regarding the turnaround, brought fresh energy. The transformation journey scripted within the first few weeks after I joined is still valid. There has been a shift from concept to execution. We have shifted the entire focus of the organisation to execution. The completion of the transformation will make this a natural process. The two concepts unveiled here looks premium, how do you get people to pay more for a Tata brand? These cars are as aspirational as they appear. We are obliged to make them affordable. Addressing the brand image was my top priority. It was extremely hard for me to accept that Tata Motors had no sharply defined brand identity. If you are a player, who is in a catch-up mode in a highly competitive market, and your brand has no credibility because of your products and service quality, you first build the brand with new products. But this is not enough. You need to make it clear what the customer can expect from the brand. It’s a hell of an exercise. Connecting aspirations was the brand promise that was created for the passenger and commercial vehicle businesses. If all these come together, we won’t have to play at the lower end of the price range and we will meet our targets. 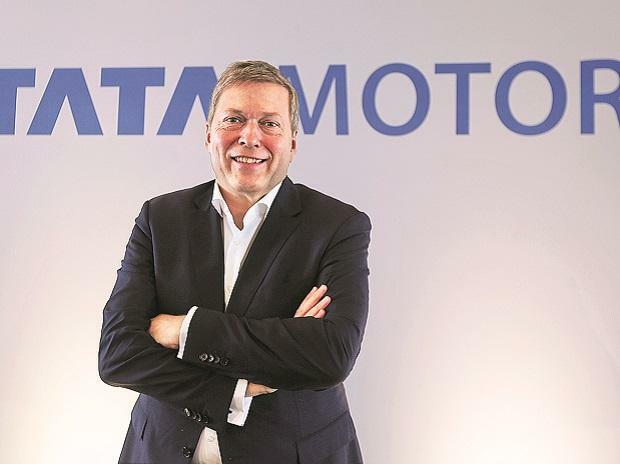 Tata Motors domestic operations turned profitable in the third quarter after five quarters of losses. Is it sustainable? The third-quarter performance is not a short-term gain by postponing something to the next quarter or fiscal. The improvement is structural and sustainable. It is going to stay. The product cost optimisation we have undertaken is sustainable and it involves turning optimisation into margin improvement. Do we see profits improving further? It is a beginning point. Six per cent of EBIDTA has improved due to volume-driven effect. We are still shaped by market conditions. If the market goes crazy (like it happened in 2016-17) we are still not fully protected. However, we are much more robust now. My colleagues in the past would have always explained that the market caused the problems. I believe volatility is a fact of life. It is our accountability to actually protect ourselves to the best possible extent. This defines turnaround. What is your take on hybrid technology? My view goes against the interest of many auto companies. I don’t need incentives for hybridisation. Hybridisation is a simple stupid electric attachment to an internal combustion engine which we anyway need in order to meet the regulatory environment. Why shall government budget go on this? The future in this country needs to be electric. Any incentive on hybrid is going to postpone the movement to electrification.